Academy Stars from Macmillan Education is a new seven-level course for pupils aged from 6 to 14. This is a modern course with innovative features, developing all language and skills, with an emphasis on communication in English. It provides a vibrant and memorable learning experience. 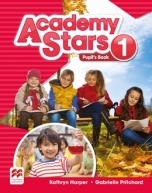 Academy Stars extends beyond language learning to prepare pupils for success on a local and global scale. The course is accredited by the Ministry of Education (doložka MŠMT). For more information, please visit the Macmillan Education website.